According to the Dubai Health Authority (‘DHA’), medical tourism is now estimated to generate revenue of over AED1.4billion for the Emirate of Dubai annually. The healthcare sector already accounts for 3.6 percent of the GDP of the Emirate of Dubai. The UAE healthcare sector is forecast to grow at an impressive rate. The UAE’s Vision 2021, the highest-level U.A.E. government strategic plan, aims to provide ‘world-class healthcare’ as one of its priority goals. This will be achieved by, among other measures, assessing all public and private hospitals according to clear national and international standards. It should not be forgotten however, that the healthcare sector is no different from any other sector in that it faces exposure to criminal actors. As with many lucrative, high-value services, routine check-ups of the medical industry have uncovered an insidious virus under the skin, with toxic actors attempting to leach from the system. This article briefly reviews the attempts of the UAE authorities to limit healthcare fraud in order to give the UAE a clean bill of health. Healthcare fraud is a financial crime and regulatory issue that may be committed by healthcare providers, consumers, businesses providing medical supplies or services, and/or healthcare organisations. The common types of fraud committed by physicians include billing for services that were never rendered, providing unnecessary treatments or tests, falsifying or exaggerating the severity of a medical illness, accepting kickbacks for referrals, and billing for a more expensive diagnosis or procedure that is not required. Due to the high illicit yield that this may provide, there is now a global trend toward increased participation by organised crime groups (‘OCGs’) in complex healthcare fraud schemes. In addition to the UAE’s crackdown on all forms of financial fraud, there has been renewed interest by UAE healthcare regulators and government officials such as the DHA and The Department of Health in Abu Dhabi (‘DOH’), in promoting transparency and accountability within the healthcare sector. Investigation of healthcare fraud is becoming one of the regulator’s major priorities. DHA Outpatient Care Facility Regulations 2012. Provisions of benefits and incentives may, in limited instances such as the provision of promotional items of nominal value, be provided only if they do not offend the UAE’s Penal Code, the principles of insurance fraud, the DOH policies, or, the DHA policies. The DHA issued the Outpatient Care Facility Regulations 2012, which prohibits referring physicians from taking any commission for referring a patient to a specific clinical laboratory service provider. As above, where there is criminal intent, the offer or acceptance of payment of a referral fee to a healthcare provider may be viewed as a bribe. 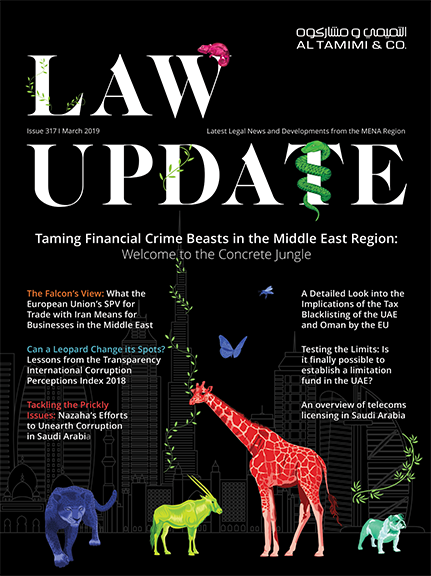 Following amendments and expansions to its anti-bribery provisions in 2016, the UAE has again updated its bribery provisions in the Penal Code, through Federal Law No. 24 of 2018 amended by Federal Law No. 3 of 1987. It is a criminal offence in the UAE to offer or accept a bribe in both the public and private sectors. Accordingly, a bribe offered or received by a healthcare provider may face sanction by the UAE authorities. Further, Article 65 of the Federal Penal Code provides for corporate criminal liability and ensures that a company, such as a healthcare provider, can be held criminally liable for acts of bribery committed by its employees, representatives or agents, where the company has acted in bad faith and ‘acted’ in the commission of the offence. Innovation, and specifically technological innovation, has recently become one of the most popular growing trends for social and economic development within the UAE and globally. Innovation was defined in the UAE National Innovation Strategy 2014 as, ‘the aspiration of individuals, private institutions and governments to achieve development by generating creative ideas and introducing new products, services and operations that improve the overall quality of life’, with the aim of making the UAE the most innovative nation in the world within seven years. The UAE has chosen the healthcare industry as one of the primary sectors to stimulate innovation. Healthcare fraud is not to be considered a victimless crime. Fraud increases the costs of providing medical services. This may result in a reduced benefit in healthcare coverage or higher policy excess payments for individuals. Physicians may perform procedures to increase reimbursement, compromising patient safety. If medical providers do bill for services never rendered, they create an inaccurate medical history for patients. This may cause patients difficulty at a later stage in obtaining insurance policies. An inaccurate medical history may also affect treatment decisions and allow some insurance companies to deny coverage to an individual based on a previous medical condition. alert your insurer if a healthcare provider offers to bill the insurer for an uncovered service. The vast majority of healthcare practitioners in the UAE act with honesty and integrity. However, certain individuals will attempt to cheat the system for financial gain. Healthcare fraud destroys the reputation of the medical profession and raises questions in relation to governance of physicians’ conduct.